With this release the first version of Crnk 3.x is released. There have been many incremental improvements to the code base over the past year. In particular the relationship handling has been automated in a number of ways. 3.0 has taken the features and learnings from this time and improves upon some of the configuration defaults. This in turn allows to setup resources and relationships more simply, more quickly and with fewer lines of code. A variety of new features complement the release, most notably the generation of Asciidoc documentation and a type-safe query API. While being a major release, changes required should be minimal (see below). A first BETA is available. Further BETA releases are going to finalize the new features and providing more documentation and examples. The V2 suffixes have been removed from the repository interfaces. They have been in place for historic reasons to replace QueryParams-based repositories. QueryParams carry new "Legacy" prefix. Repository interface make us of the Collection type rather than Iterable. The later can be quite cumbersome to use and not necessary for this particular use cases. Resource identifier no longer must extend Serializable. There has been no requirements and complicated their usage. RelationshipRepositoryV2 and BulkRelationshipRepositoryV2 have been deprecated in favor of OneRelationshipRepository and ManyRelationshipRepository. The new repositories have a number of advantages. Finders of the new repositories follow the concepts of BulkRelationshipRepositoryV2 to have efficiency by default. RelationshipMatch is used by default to bind the repository to resources. Repositories may still implement both interfaces to gain the original RelationshipRepositoryV2 functionality. JPA repositories with DTO mapping now behave exactly like regular resources. Make sure that the DTOs are properly annotation with @JsonApiRelation and @JsonApiRelationId. No information is inferred from the underlying entities. RepositoryDecoratorFactory has been simplified to a single decorateRepository method and WrappedResourceRepository, WrappedOneRelationshipRepository and WrappedManyRelationshipRepository. There are no dedicated decoration repository interfaces anymore, just the regular interfaces. Decorators have been removed form the JpaRepositoryConfig. The regular RepositoryDecoratorFactory can be used instead. @JsonApiRelation.oppositeName has been deprecated in favor of @JsonApiRelation.mappedBy. See below for more information. Be aware of the changed semantics. The property must only be set on one side. New defaults for @JsonApiRelation.lookup and @JsonApiRelation.repositoryBehavior should allow to eliminate a large part of the custom configuration. For more information see below. crnk-jpa has been renamed to crnk-data-jpa and the Java package updated accordingly. crnk-activiti has been renamed to crnk-data-activiti and the Java package updated accordingly. Let us know if you still continue to make use of QueryParams. Otherwise it is going to get dropped in a subsequent Beta release. Still work in progress, but crnk-example has been updated to use the various 3.0 features. The owning side is typically the single-valued field. This is because the single-valued field is something like a column in a database table that can be accessed and updated. In contrast, the multi-valued field can only be obtained by specifying issuing a query against the single-valued field and as such not suitable to be the owner. The behavior matches with similar JPA-related annotations. Under the hood the mappedBy property will trigger a suitable default for @JsonApiRelation.repositoryBehavior and @JsonApiRelation.lookup on both sides, simplifying the relationship setup for most use cases. If no relationship repository can be setup, Crnk will no fail directly upon startup. Relationship implementation can greatly vary. For this reason the various attributes of @JsonApiRelation historically had most features disabled by default (forwarding, serialization, etc.) to let developers configure what is needed. Over the past year a variety of tooling has been added to simplify the relationship setup, which in turn made the conservative defaults less suited than in the past. With this release new defaults have been introduced that inspect the resources and repositories more closely to decide for a particular default value for @JsonApiRelation.lookUp and @JsonApiRelation.repositoryBehavior. 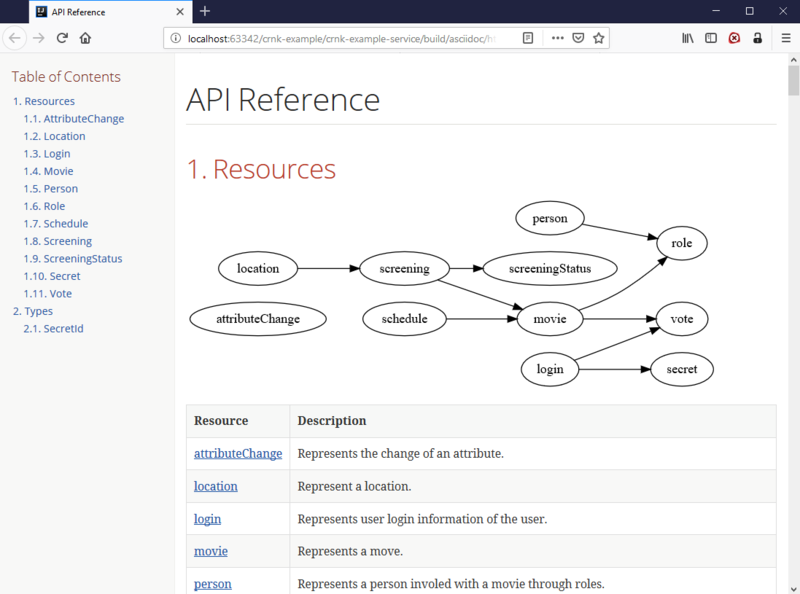 Have a look at the updated documentation and the new example in the documentation. More information is available in the documentation. Please provide feedback in this area! Sub-100ms startup times and reduced memory requirements to reduce cost and open up new application fields like serverless computing. An annotation processor is introduced that allows the type-safe construction of QuerySpec and PathSpec. The Gradle Typescript generator adds support for the generation of artifacts other than Typescript. For this purpose the project has been split into `crnk-gen-gradle`, `crnk-gen-typescript` and a number of helper projects. More information about Typescript generation is available here. The new crnk-gen-asciidoc project helps automating REST documentation. It makes use of two kinds of sources: resource classes and test cases. The resource classes give an overview of a REST endpoint with a list of available resources, attributes and relationships. Whereas test cases can serve as examples for developers. 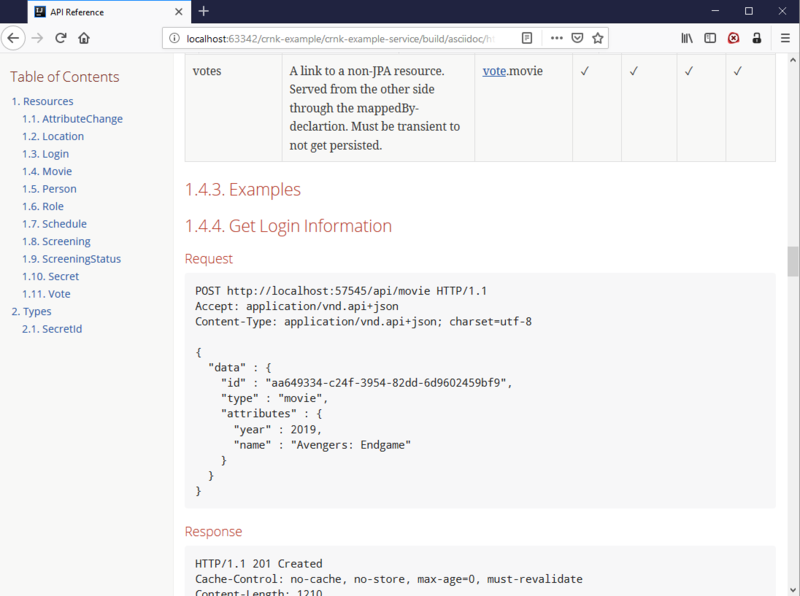 This mix of model-driven and test-driven documentation together with the standardization provided by JSON:API can greatly help in writing consistent, documented REST endpoints. For more information have a look at the documentation and crnk-example. CrnkClient client = new CnrkClient(url). A new HttpAdapterListener can be added with addListener to HttpAdapter. It allows to cover many of the typical use cases like adding security headers without having to get and customize the underlying HTTP implementation. The PlainJsonFormatModule can now be added to CrnkClient. This is in particular useful together with the Asciidoc generator to create documentation in the plain json format for consumer making use of it. OpenTracing is a vendor-neutral API to write trace information. crnk-monitor-opentracing introduces a new module OpenTracingServerModule that brings support for OpenTracing to Crnk. It can be used properly set the names of spans. More information is available in the documentation. crnk-data-jpa maps Enum types to Strings for Activiti. This to by-pass the regular Activiti serialization mechanism that treats the enum like a java.lang.Object by storing it is as serialized blob and not supporting filtering. JpaModule.createServerModule(...) comes with a new flavor that allows to pass the EntityManager as java.util.Supplier. Every time a repository makes use of the EntityManager, the supplier is called and must return an instance. The supplier together with the existing TransactionRunner allows for custom JPA setups and transaction handling.